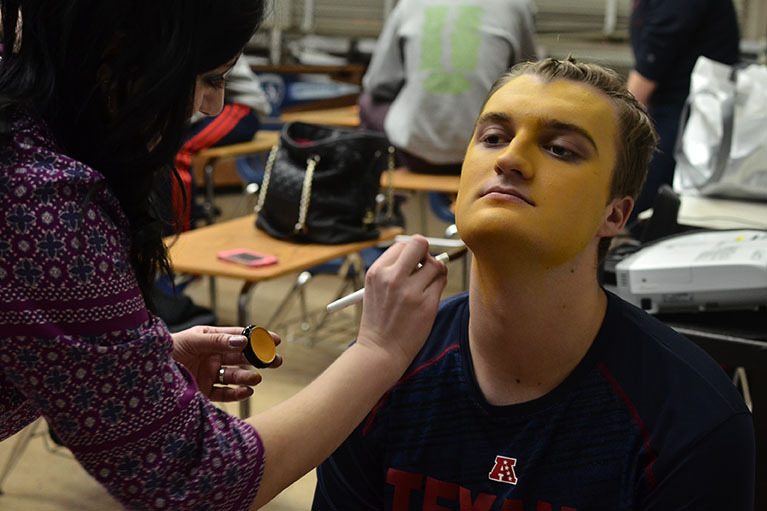 Senior Nolen Wright gets his face painted yellow in preparation for his role as the Cowardly Lion. On Saturday Nov. 5th, senior Nolen Wright walked into Olathe East High School to try out for one of the five District Honor Bands in Kansas. From the middle of July to Nov. 5th, Wright practiced two pieces of music for his audition for about an hour to an hour and a half each day. Wright made the District Honor Band. He will perform a concert with them in December and will be eligible to tryout for all state band. Wright’s music career started on the clarinet in 6th grade. The following year, he switched to the saxophone. Wright’s mother’s side of his family is all musically inclined, and she went college on a full ride for a band scholarship. Wright would also like to pursue music post-high school, even if it’s not a full time gig. “I love it! All the people in the musical, I like being around those people, so I was like ‘Why not tryout for the musical?’” Wright said. Going on stage for the first time, can be nerve-racking or terrifying but Wright had a different perspective. “I came out and people started applauding, it really threw me off and I was like, ‘What? I haven’t done anything yet,’” Wright said.